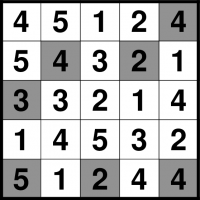 Hitori puzzles are in one sense a little like an "inverted Sudoku", given that they include the row and column constraints of that puzzle but start with all digits placed. In Hitori the aim is to hide digits such that no digit repeats, while also following some additional rules specific to Hitori. In a Hitori puzzle you start with a full grid and must eliminate digits (or letters in some puzzles) by shading them in so that no digit occurs more than once in any row or column. Unlike Sudoku, there is no requirement to have every digit in each row or column - this would not be possible in any case. Additionally, the finished grid must be a valid "Japanese crossword". What this means in practice is that all of the unshaded squares must be connected into one single region, just as they are in a traditional British or US crossword, but also that no shaded square can touch any other shaded square (except diagonally). Shade some squares so that no unshaded digit or letter is repeated in a row or column. No shaded square can touch any other shaded square horizontally or vertically (but they may touch diagonally). You must be able to 'travel' from any unshaded square to any other unshaded square simply by moving left/right/up/down from unshaded square to unshaded square. Every Hitori puzzle only ever has one possible solution, and it can always be reached via reasonable logical deduction. In other words, guessing is never required. Hitori puzzles on puzzlemix appear at a wide range of sizes and difficulties. The most common sizes are 7x7, 8x8, 10x10 and 12x12. Are you searching for help with Hitori puzzles? Stuck on solving Hitori? Don't know the instructions for Hitori? Need Hitori instructions? Want solving hints and tips for Hitori? Then puzzlemix is the place for you to play Hitori puzzles online. Looking for printed Hitori puzzles? Visit Sudoku Xtra for puzzle magazines and books. Or are you looking for a Hitori puzzle supplier? If so then check out Any Puzzle Media, my puzzle production company.